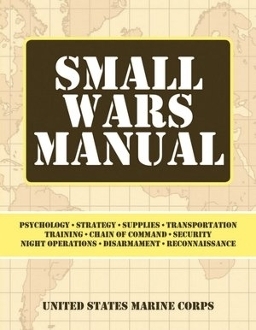 Originally published in 1940 by the U.S. Marine Corps, this book examines the practical and philosophical aspects of low-intensity conflicts, which were then referred to as ‘Small Wars.’ This is one of the best books on military peacekeeping and counterinsurgency operations published before World War II. As an historical artifact, it offers insight to a rarely seen and often overlooked period in American history. Topics include strategy, psychology, dealings with foreign civilians, as well as implementation of a democratically-elected government. A great addition to the library of any historian, military man or concerned citizen!